Transition Is A Force And A Process Of Change. That Empowers For Growth And Prepares For Greatness. Life Is A Process-Where You Grow As You Go. Process Of Change Is The Key To Building Relationship With Life. If You Don’t Embrace How Life Is Treating You. You Can Never Appreciate What Life Will Offer You. 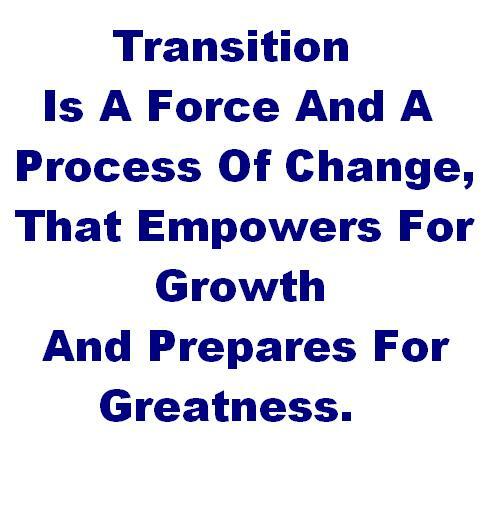 Transition Is The Period That Must Be Undergo If You Want A Change From Where You Are To Where You Need To Be. Hate Complacency And Embrace Transitioning. Remember A Journey Of A Thousand Miles Begins With A Single Step. This entry was posted in Self Development, Spirituality, The Peace, The Secret, Vitamin Of The Mind, You! and tagged Bishop David Oyedepo, Jim Rohn, Pastor E A Adeboye, Rotimi Adedokun, The Power Of Change, THe Process Of Transitioning, Transition, Transitioning Process. Bookmark the permalink.